This is a very hearty, rich soup. Perfect for cold weather. 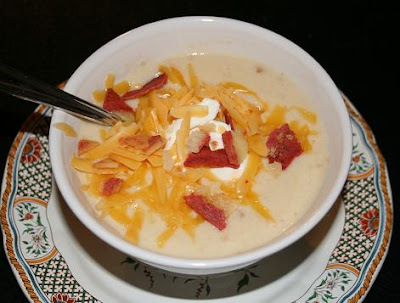 It has more depth of flavor than regular potato soup since the potatoes are baked first. You can serve it with a variety of toppings: grated cheese, sour cream, veggie bacon bits, green onions, or chives. The original recipe was in Cooking Light magazine. Preheat oven to 400F. Pierce potatoes with a fork and bake for 1 hour or until tender. Cool. Peel potatoes and coarsely mash them. In a large pot, melt the butter over medium heat. Add the onion and saute until soft. Sprinkle flour over onion, gradually add milk and whisk until smooth. Cook over medium heat until thick and bubbly. Add mashed potatoes, cheese, salt and pepper. Stir until cheese melts. Remove from heat. Stir in sour cream. Serve with toppings of choice. I made this soup today and it tastes sooo good! It was actaully easy and not as time consuming as I thought it would be. Loved it! Let's just say it's a keeper in my menu book. Thanks for the recipe!